The doctor was extremely knowledgeable about the genetic situation of my children. He conducted a thorough exam and my childrenwere receptive. Office staff is also pleasant! 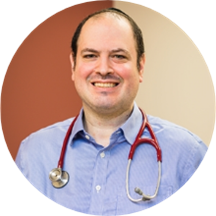 Dr. Avraham Gottesman is an amicable pediatrician based in Brooklyn, NY. Dr. Gottesman is affiliated with New York University Elaine A. and Kenneth G. Langone Medical Center and presently sees patients at his own practice. There, he undertakes consultations for general pediatrics and conducts pediatric annual physicals and well-baby check-ups. He is certified by the American Board of Pediatrics. Dr. Gottesman earned his medical degree from the Albert Einstein College of Medicine of Yeshiva University. Further, he completed a residency in pediatrics at Schneider Children's Hospital. He fluently converses in English and Hebrew. Dr. Gottesman knows how to examine and treat children in ways that help them relax and cooperate. His extensive knowledge base and exceptional clinical experience in pediatrics ensure that children receive the best quality care. Quick wait my son loved him. He listened to everything I said & followed up with great referrals , suggestions, and tips. Dr. Gottesman is a fantastic Dr. He cares for each of his patients and gives them all the time they need at each visit.